The Kentucky Derby Museum is celebrating its new companion pony, Tatanka, with a birthday celebration! Tatanka has now taken up residence at the Museum alongside current resident Thoroughbred, Populist Politics. The two are carrying on the Museum's long-time tradition of having horses on-site for guests to experience when they visit. With no known foaling date, the Museum declared January 15th as Tatanka's official birthday. He celebrated turning four with a bouquet of carrots… and cake for all the human visitors who came out to mark the occasion with him. 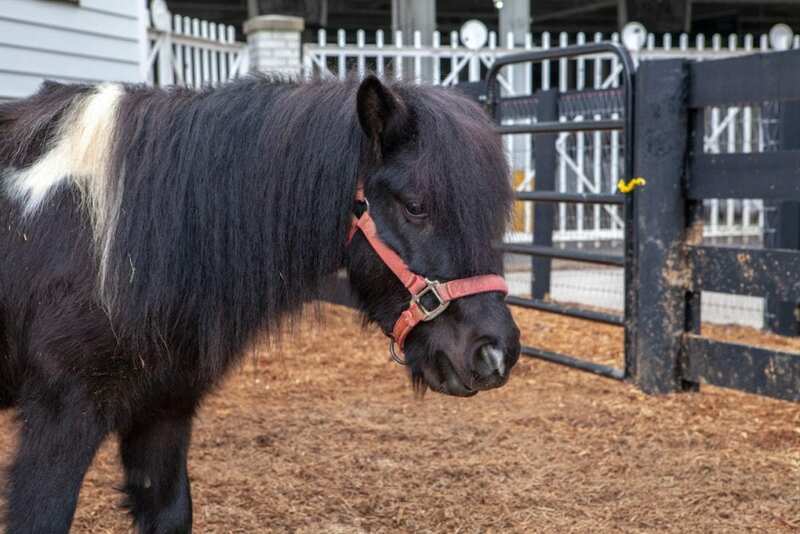 Winston, the Museum's beloved miniature horse and long time ambassador for over 23 years, served as the companion animal to more than 30 resident Thoroughbreds. He passed away last May. Plans for a Winston memorial will be announced later this spring. Tatanka and the current resident Thoroughbred, Populist Politics, are the first horses to live in the Museum's brand new stable facilities. The barn is dedicated to Penny Chenery, the famed owner of Triple Crown Winner, Secretariat. Her daughter, Kate Chenery Tweedy, was on hand last November to officially dedicate the barn when the Museum opened its new 16,000 square foot expansion and renovation project. This entry was posted in NL List, The Biz and tagged buffalo, churchill downs, kentucky derby, kentucky derby museum, populist politics, second stride, tatanka, thoroughbred, winston by Press Release. Bookmark the permalink.